Start a memorable experience in Houston by catching the I-10 in a Mercedes-Benz AMG. The trip in a Mercedes-Benz AMG on one of the fourth longest east-west interstate highways takes you through the greater Houston area to beautiful Santa Monica, California. Or if you’d rather head east of Houston, the end of the line will be in Florida. Mercedes-Benz AMG cars are made for road trips like this and rugged environments. The Mercedes-Benz ML63 AMG and Mercedes-Benz GL63 AMG deliver beyond expectations when you need coupe-like performance from an SUV or crossover that handles unpredictable terrains away from the highway on around cities like Houston and Dallas. The ML63 AMG is the Mercedes-Benz AMG version of a crossover in a stylish package with comfort, space and off-road performance. The G55 AMG loves to serve those who camp, drive hard trails and spend a lot of time in a rugged environment. If flying is your thing, you can do that in the Mercedes- Benz SLS-Class AMG GTCoupe Final Edition with its atypical gull-wing doors, lightweight aluminum body and AMG 6.3-liter V8 engine roaring with 563 hp and 479 lb-ft of torque. The cockpit turns a driver into a pilot with its aviation-style set up. This supreme performer hits 60 in fewer than 4 seconds and reaches a top speed of 197 mpg. If speed limits disappear for a day, you can fly from Houston to California in no time flat. The Mercedes-Benz AMG sedans like the Mercedes-Benz S63 AMG aim to please the selective driver that desires a combination of sporty design with everyday practicality. The Mercedes-Benz AMG lets drivers enjoy racecar performance on the weekend and a refined ride to the office during the week or driving in style to Houston to attend a wedding. If you go west on I-10 to Jacksonville, you could switch highways to go south and head to the racetrack in Daytona. When you do, the convertible Mercedes-Benz SL63 AMG roadster will feel right at home in Daytona while inviting nature to the party. Whatever your Mercedes-Benz AMG preference, count on getting performance and luxury in one package. Park Place Motorcars in Dallas has many Mercedes-Benz AMG cars for sale that customers come all the way from Houston and surrounding cities for the dealership’s vast inventory and famed customer service. Thank you to all of our vendor partners who attended the Park Place Partner Appreciation Event at the Texas Tornados game this past weekend. In attendance were our partners from AIMedia, AutoTrader, BlackBook, CARFAX, Cars.com, Costco, eCarList, WrightIMC, and our content maven, Meryl Evans. “We are grateful for all of your contributions in 2010 to make Park Place Dealerships successful,” said Frank Sobyak, Director of Internet Business Development. “It is your partnership and your expertise that helps put the excellence in Park Place.” Below are some photographs from this memorable family event. We all had a good time, and perhaps the kids enjoyed it the most! Mike Ostrom works to ensure our paid search campaigns are successful. Mike, his wife and family cheer on the Texas Tornados. Meryl Evans creates all of the wonderful copy for our new model overviews, and through her words, she has the unique ability to bring our vehicles to life. Here she poses with her family. Jerry Salerno from eCarList. He and his team help direct our website functionality and populate vehicle information across the Internet – in addition to hundreds of other things they do to help make Park Place successful. They have an extremely sharp team at eCarList and we are greatly appreciative of all of their efforts, their loyalty and their commitment to Park Place. Left to right, Scott Gipson, CARFAX; Frank Sobyak, Park Place; Dwayne Marshall, CARFAX; Jodi Donley, AutoTrader and Scott Horton, BlackBook. Our friends at CARFAX are there to make sure that free CARFAX reports are always available to our clients. CARFAX reports help give our clients peace of mind in knowing that they are getting a quality vehicle. Jodi Donley of AutoTrader is very helpful in making sure we use the AutoTrader service to its fullest extent possible. She is instrumental in helping us understand and try new services. Troy Ford is with Costco and he helps coordinate all of our vehicle displays. We are very appreciative of our great vehicle placements over the holiday. Big Porsche fans, Meryl’s kids and Kayla get a ride in a 2011 Porsche 911. Scott Horton from BlackBook with his family. Scott helps ensure that the BlackBook trade appraisal tool is always functional for our clients so that they can get a true and fair value on their trade-in. Arena party photo. Standing, Israel Alpert. Thanks to your and your team for working with Park Place to develop and provide the best vehicle videos on the market. Together we have come a long way. Tony Wright and his team make sure our dealerships can be found online when clients are searching for our products and services. The SEO services of WrightIMC are unparalleled in the industry. Thanks for a great job and many hours of dedicated commitment to all our Vendor Partners. American Heart Association’s National Wear Red Day February 4, 2011 Park Place Dealerships will be going red inside and out in support of the American Heart Association’s National Wear Red Day – Friday, February 4, 2011 – a day when Americans nationwide will take women’s health to heart by wearing red to show their support for women’s heart disease awareness. Park Place Dealerships will donate $25 to the American Heart Association for every authorized test drive at any of our participating Dallas-Fort Worth dealerships on Friday, February 4 or Saturday, February 5. In addition, Park Place Dealerships is allowing its employees to wear jeans with a red shirt or blouse February 4th in exchange for a $5 donation to AHA. Women are encouraged to take the “Go Red Heart Check Up,” a free interactive online assessment tool that helps women take charge of their heart health. Simply enter your information into the questionnaire at www.GoRedForWomen.org. The website also offers tips on heart health and ways to get involved to make a difference. Heart Disease Doesn’t Care What You Wear… It’s the #1 Killer of Women. Disney star Demi Lovato turned 17 last August, but she couldn’t really celebrate because she was in Canada filming Camp Rock 2 with the Jonas Brothers. The film recently wrapped and Demi returned home to her family in Colleyville. One of her first stops was to visit her uncle David De La Garza, and to pick up her first car: a new 2010 Mercedes-Benz E350. At the very top of her list was a trip to the Texas DMV, reports De La Garza, Finance Director at Park Place Motorcars Dallas, She wanted to have a Texas driver’s license rather than a California one. And she would only buy a car from Park Place Motorcars here in Dallas for obvious reasons. David De La Garza’s brother Eddie is Demi’s stepfather and manager. Demi’s mom Dianna is a former Dallas Cowboys Cheerleader and singer. Demi’s younger sister Madison De La Garza plays Juanita Solis (Eva Longoria’s daughter) on ABC-TV’s Desperate Housewives. Her oldest sister Dallas Lovato is an actress and singer as well. Demi got her start on the locally produced Barney & Friends TV show. 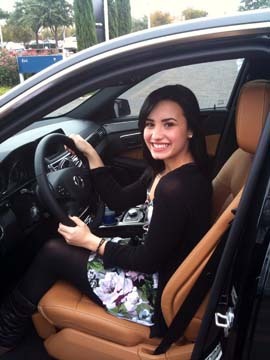 She ordered the 2010 E350 back in July, said De La Garza. The car is as loaded as you can get a car. It has absolutely everything: a high-end sound system, iPod kit, Parktronic, etc. Best known as Mitchie Torres in the Disney Channel Original Movie Camp Rock, and Sonny Munroe in the Disney Channel’s TV series Sonny With A Chance, Lovato is also a solo music artist. Her first album Don’t Forget debuted at #2 on the Billboard 200 in September 2008. Lovato released her second album, Here We Go Again, last July. The album debuted at #1 on the Billboard 200, selling over 108,000 copies in the first week. I have a firm commitment from my brother that all their luxury car purchases will be through Park Place, says David De La Garza with a smile. He knows there will be family trouble if they don’t.